Oh dear! I see my last blog was 2016; is it really that long since I posted? It’s my New Year’s resolution to do this more frequently (somebody’s New Year must start on 19th October…???) 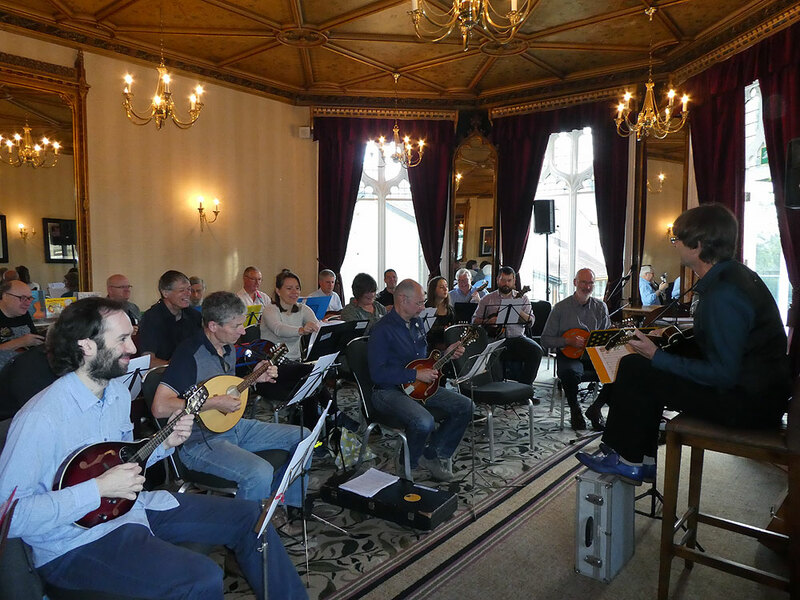 The now annual Mandolin Retreat at Kenwood Hall Hotel in Sheffield went off with a bang again a couple of weeks ago, with the resultant mandolin orchestra of 25 players sounding as sweet, if not sweeter than ever. 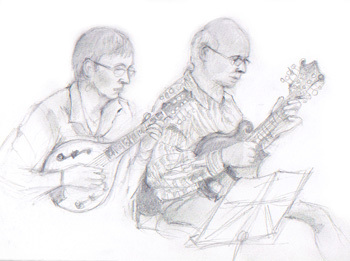 We have many regulars at these gatherings, who enjoy not just the mandolin playing but the social side of things too. Where else do you get so many like minds in one place?! This year threw up a surprise special guest in the form of bluegrass mandolinist Jordam Ramsey, a superb American player over on tour with his band Ragged Union and taking a few days holiday too. Jordan gave us a short tutorial on the technique of crosspicking. “Didn’t we have a lovely time, the day we went to Kenwood!” wrote Phil Nixon afterwards. Yes we did! The hotel lived up to our expectations: comfy beds, good food, smiling and helpful staff. Twenty-five of us gathered in the magnificent setting of the Terrace Room and played our hearts out. Here are a few stills; a bigger batch can be downloaded here. It all turned out well in the end, but at just twenty-four hours notice, the mandolin workshop weekend I was supposed to be hosting last January was postponed due to an outbreak of norovirus at the venue, the otherwise idyllic 15th century Halsway Manor, nestling at the foot of the Quantocks in Somerset. 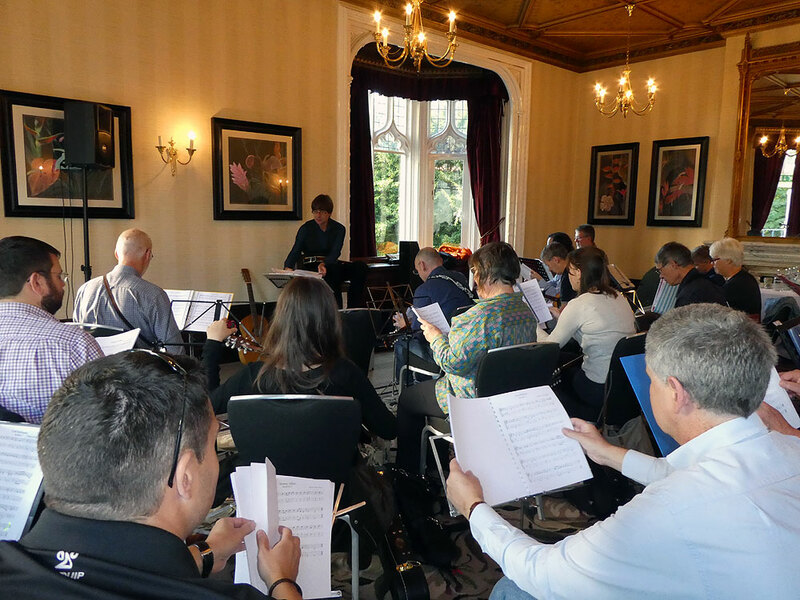 Norovirus aside, it gave rise to symptoms of acute ‘mandolinus interruptus’ among the forty disappointed musicians who were due to attend and indulge in a weekend of group playing, nerdy chat (why not?) and a little light alcoholic refreshment. As host and tutor, it felt particularly galling as I had put in a lot of preparation arranging tunes in parts, making sure all participants had received the music and sound clips in advance and generally psyching myself up to answering questions about plectrum thicknesses, string gauges, action heights, performing in the concert with Hilary James on the Saturday night, and generally being ‘on duty’ all weekend. 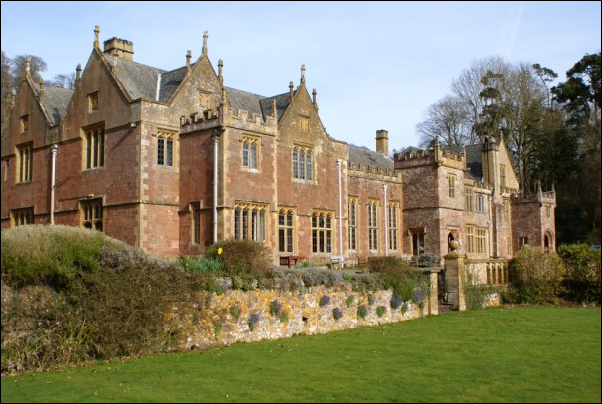 I had been at Halsway for a similar event in 2015 and had found it immensely enjoyable despite the sense of responsibility, so I was relieved when the venue suggested we reschedule for Easter weekend. I was available, but inevitably some people were not. We still managed to number about thirty, and, as before, the combined forces were sounding like a half-decent mandolin orchestra by the Sunday afternoon. The mandolins were helped by a couple of mandocellos, a liuto cantabile (an Italian five course tenor-voiced mandolin) and one participant who had travelled all the way from Belgium with mandolin, mandola and mandocello, and even played mandobass (borrowed from Hilary James) for some of the time. If there is one thing that makes me particularly apprehensive about leading such a large group, it is that the range of abilities will almost certainly be wide. This was indeed the case; no fewer than six people described themselves as complete beginners and were just about able to run up and down a major scale, read tablature to a speed of one note per bar, all the time still feeling uncomfortable holding a plectrum. At the other end of the scale were people who were already experienced in playing in mandolin orchestras, bluegrass bands, or just very good amateurs who played at home or with friends. My previous experience had been that the beginners rise to the occasion, surprising themselves at how much they achieve as the weekend progresses. Nevertheless, I took the precaution of including one very easy part in all the tunes I arranged. Hopefully, nobody felt left out. Nobody was expecting high French cuisine, but, as before, the food was good and the staff were a delight. In the end, despite the norovirus, a great time was had by all, and it’s in the diary again for January next year. I just dug out these MP3s of three half hour programmes I did for BBC Radio 2 back in 1996. You can listen to the full programmes here – but please bear in mind that much of the information given is now out of date. Programme synopsis… If mandolin maestro Simon Mayor were marooned on a desert island, there’s no doubt about the one luxury he’d take. In this series of three programmes he goes in search of the origins of the mandolin, looks at what’s happening the world over, and tries to find out why players from Naples to Nashville go wild about it! The series features interviews with many of the world leading players, choice examples from disc, and some amusing anecdotes. After a couple of years break, it’s great to be contributing a mandolin column to Acoustic Magazine once again. My first offering is in the current issue (as I write), No 114. It’s an unusually slow version of the beautiful traditional tune Golden Eagle. Future columns will be in alternate issues – the even numbered ones. The magazine caters mainly for acoustic guitarists, but with nods towards other fretted instruments. Amazing what a nice hot bath and a good sleep can do! It’s the day after… and I’m feeling human again. What an enjoyable weekend! It was so lovely meeting mandolinists from all over the country, and a big ‘thank you’ to all for your contributions both musically and socially, for your sheer enthusiasm, kind words and of course bottles of beer. 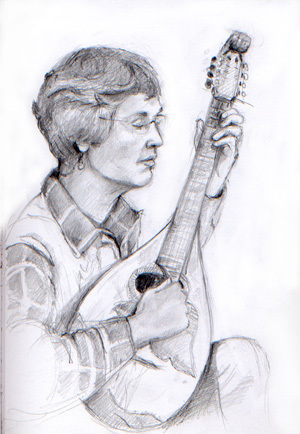 Hilary James was indulging in some drawing. Here are the fruits of her labours; if you click on any of the images you’ll get a high resolution version. The setting, the wonderful staff, the roaring log fire, the late night cocoa… all made for a memorable couple of days. Very much looking forward to a return visit in 2016. As a musician – a mandolinist and violinist (fiddler) – I find it strange how one can live on a street for over seven years without meeting a neighbour who lives about 100 yards away, a talented professional violinist who, to my great delight, is keen to learn the mandolin and who has acquired a couple of rather splendid looking old Italian instruments, albeit not in playing condition. Being English, we were both waiting seven years to be introduced, but now the ceremonial formalities have been undertaken we’ve been making up for lost time by playing some fiddle tunes together and she’s threatened me with Mozart next time we meet. On the mandolin front I had to break the bad news to her that the majority of old Italian mandolins in the UK were made for the tourist trade and are pretty nasty instruments suitable for wall decoration and little else. However, I’m a player and not a historian, so I volunteered to check out the makers’ names with my friend Paul Sparks, international authority on the subject, author of two mighty tomes for Oxford University Press, and as I was reminded the other night over a beer and a pizza, infectiously enthusiastic for his subject. I had suspected that one of these mandolins, the more modestly appointed, was a good instrument. Paul confirmed my suspicions. Although not the most highly prized round-backs, the mandolins of Umberto Ceccherini are very well respected, and definitely worth restoring. Fortunately for my neighbour this particular instrument needed little work and is currently in the very capable hands of our local maker and repairer Mick Johnson. Interestingly, it has a second soundboard, a ‘tone producer’ suspended just a couple of millimetres below the top, and visible through the sound hole. It’s a feature I have rarely come across, although for a brief period many years ago I played an old Radiotone mandolin which had one. The Americans refer to this device as a Virzi, after the brothers who patented the idea in the USA in the 1920s and offered them as a retro-fit to violins and mandolins, but the occurrence in my neighbour’s Ceccherini, which predates the Virzi patent by around twenty years, indicates the idea was already prevalent in Italy. Players have always been unconvinced, and my old Radiotone certainly wasn’t a great mandolin. Many have had them removed, ironically to improve the sound, and to my knowledge no luthier is currently using the idea. Nevertheless, the Ceccherini remains a significant piece of musical history and should, and I’m sure will, be kept in its original state. I have every hope it will emerge from Mick Johnson’s workshop sounding sweet and inspire my neighbour to become as good a mandolinist as she is a violinist. As a postscript I should add that the other mandolin, an ornate sea of pearl and tortoiseshell (I think there may be some wood in there too), with exquisitely fluted ribs, is also to be restored despite the fact that the maker, Carlo Rinaldi, is of little repute. This will be a significantly more time consuming and expensive job, risky too in case it doesn’t sound great, but the good news is that two musical instruments will be played again, and that is exactly why they were made. Author Paul Ruppa has kindly given permission to use this article: fascinating reading for anyone interested in the history of the mandolin family. It’s in PDF format – please click here to view. It was a predictably exhausting but hugely rewarding weekend to take part in the BMG (Banjo, Mandolin & Guitar) Federation Annual Rally, held this year in excellent premises at St Mary Redcliffe and Temple School, Bristol. The focus of the weekend was the school’s hall where, with The Mandolinquents, I took part in the opening Friday night concert. Enjoying a large stage, some professional lighting and an ambience considerably more inviting than many (this one obviously didn’t double as a badminton court), the hall filled with a mixture of BMG members and the general public. It was difficult to tell what the proportions were, but despite the undoubted high number of musicians there, there was never any way this was going to feel like an exam! It was an audience that needed no warming up (contrast the time we once played an after dinner cabaret spot to a bunch of music examiners! ), and after all the serious and semi-serious material we decided we could encore with Duellin’ Banjos and The Parrot Song, one of the many songs Hilary James and I have written for children. Everyone sang – and squarked the chorus. Very silly! 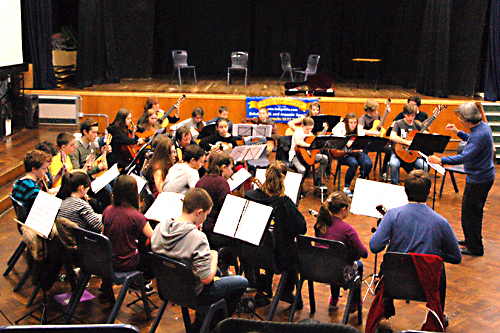 Saturday was filled with workshops on various themes for all instruments concerned. Many, including my own, were fully subscribed in advance; it was a packed day. Organiser Dave Griffiths had asked me if I could think of a workshop theme a little different from straight mandolin technique. I’d suggested I could talk about playing by ear and the basics of improvisation and Dave immediately warmed to the idea. Because it was about general musicianship, it would have been suitable for any players, but it was mostly mandolinists who faced me when I entered the room. Having given some thought beforehand to what I was going to say, I’d realised that actually these are two distinct topics. Someone with no background in musical improvisation can be taught how to apply their knowledge of music theory, using various scales and arpeggios, to ‘jam’ over a chord sequence, and in that respect I hope I succeeded for at least some who were present. But getting someone to play even a simple tune like ‘Happy Birthday’ without music is not something that’s going to happen overnight, particularly if all they’ve ever done is read the dots. Training the ear to hear intervals of pitch can take time. It made me realise what great training I’d had as a child, when my father, who had learned to sight sing from Tonic Sol-fa (Doh, Ra, Me, Fa, Soh etc) when he was young and sang in a church choir, had taught me to do the same. We’d sing songs – absolutely anything we knew – in Tonic Sol-fa for fun, and I never realised at the time just how beneficial this would be to me as an adult. Saturday evening we all decamped to the nearby Mercure Hotel. The drinks were priced outrageously but the roast beef was very acceptable and it was a comfortable room. The BMG scratch ceilidh band did an excellent job of keeping the rhythm going as we (mostly English I assume) conspired to mess up The Gay Gordons, and we had some excellent instrumental spots between the dances from various duos and trios. My baby zebra skin winklepickers had caused something of a stir at the previous night’s concert and Ian Steel, not to be outdone, had nipped out to Asda or somewhere and found similarly patterned furry carpet slippers. I was brimming with jealousy! I thought my find on the reduced rail at T K Maxx in Leeds had been a once-in-a-lifetime opportunity. Sunday was competition day, and with so many categories! It had obviously been a timetabling nightmare to make sure that both judges and participants could fulfill all their obligations, but things proceeded smoothly. The last time I had judged was quite a few years ago, and I was amazed at how the standard had improved. 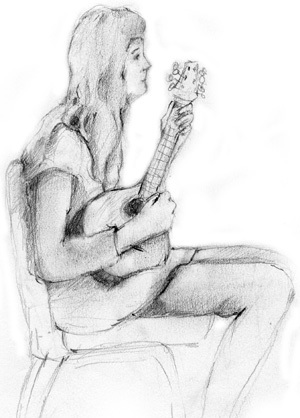 The classical mandolin competition had contestants playing challenging pieces by Calace, unthinkable on my last visit. The standard was similarly high in the folk section, but most gratifying was the high level of professionalism and musicality present in the fretted instrument orchestras. For the most part, gone was the ‘plinky-plonkiness’ associated with massed plucked strings, the unpleasant clicks of flamming plectra. Instead, we heard orchestras who had worked hard on achieving a homogenous sound, made up more of the vibrating string itself than of the plectrum crossing it; we heard excellent ensemble playing too, and great use of dynamics. The most wonderful part of the weekend was to witness how young players were now balancing older elements of the BMG. The Federation, let’s face it, has had a bit of a dusty image, but here was young blood in abundance, and some very fine players too. For me, the feel-good factor just built and built as the weekend progressed. Full credit must go to Sandra Woodruff, Dave Griffiths and all from the Bristol arm of the BMG for their organisation, and for making us all optimistic for what the plucked, fretted future holds! Have mandobass (unfortunately) won’t travel! I’ll come to that later, but first Phil has asked me to recall some of my Canadian experiences, and since I’ve never taken my trademark mandobass (bass mandolin) to Canada I’ll tell you something of my travels without it. I’ve spent five happy summers in Canada, teaching, playing at festivals and sightseeing. Their festivals are fantastic…as long as you don’t mind staying dry. Canada’s alcohol laws are a tad restrictive and preclude drinking in public places, so intoxication has to come solely from the music. Once you’ve accustomed to that idea the music really does take centre stage. Another amazing (to a Brit) side effect of a dry festival is that after a weekend of hard revelry there’s not a glint, not a hint of litter; no cans to trip over; no unsteady bodies tripping over cans that aren’t there and no large cleaning vehicles noisily scouring the site every night. Canadians are renowned for their politeness and friendliness and I’ll add to that, enthusiasm. They’re great audiences and very generous with offers of temporary double basses. Unfortunately I haven’t been offered a loan mandobass to date. I bought a Canadian acoustic bass guitar in St Johns, Newfoundland a few summers ago, and there are some excellent music shops in Toronto; one even had a mandobass which I might have bought, but as I said before, have mandobass won’t travel! ….Oh and one other thing about Canada. People always ask, “where in Engerland are you from?” When I reply “Reading” they say “NO! Not Reading!” and laugh incredulously. Could it be they’ve seen Ricky Gervais and think everyone from Reading must be funny too? No it turns out that CBC (Canadian Broadcasting) have long referred to everywhere in the globe as situated however many miles from Reading. Go figure as they say over the pond! So… back to Blighty now and I’ll tell you a bit about my life with basses. Although I’d been playing guitar for quite a few years, I hadn’t played any bass instrument until my early twenties. The band I sang with at the time had a wonderful guitarist, Phil Fentimen who is an equally fine classically trained double bass player. It was Phil who pushed me to give the double bass a go. He gave me a few tips on playing bluegrass bass one afternoon and then twisted my arm to play on stage that same evening. He lent me an instrument for six months to get me started and I’ve never looked back. My double bass is a quite respectable German 1920s factory instrument which I found through a wanted ad in the local paper. You never know what people have hidden up in the loft! It came with an extra set of hairy gut strings and a bag of used sticking plasters which the owner, a retiring dance band musician, used to protect his plucking fingertips. Amazingly, I moved into the adjoining house a couple of years later but sadly he’d died by then and so was never reunited with his bass or his plasters. A few years later I was looking for a mandobass specifically to play with mandolin virtuoso Simon Mayor’s quartet The Mandolinquents. I hoped the sound would blend better with the other mandolin family instruments. By sheer chance two people contacted me quite separately, just a week before the quartet’s first gig, to tell me of a second-hand mandobass for sale. I was astonished by the sheer size of the instrument. I had tried a friend’s old Gibson mandobass in the States but this one was bigger than the Gibson. I could completely hide myself behind it…apart from my feet. Even more startling was the size of the case! My mandobass is a very different beast from a double bass, and playing it was a challenge as I had to adapt my technique quite drastically. There are no instruction books and no mandobass teachers, so I had to figure out how to play it…painlessly. It came with a couple of felt plectrums and a retractable spike on the side for playing at a 45 degree angle with the neck crossing my body (like a big guitar). After some experimentation, I found it easier to pluck the strings with my fingers than with the felt plectrum. Unfortunately I began to have pains in my right hand, particularly after “tremeloing” with my two forefingers. I had the fingerboard extended so that it now passes over the sound hole. This gives me an anchor for my plucking hand. It’s probably not ideal but doesn’t seem to have had much effect on the sound. After a lot of experimentation with different hand positions I found a comfortable, ergonomic playing position and haven’t looked back. I settled on two alternative playing positions. 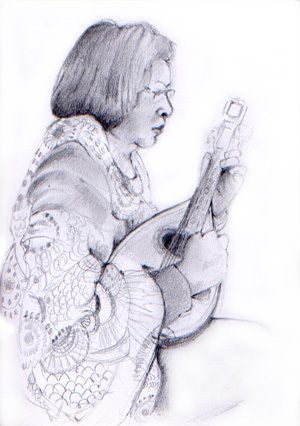 To play instrumental pieces with the Mandolinquents I sit and play it as originally intended, but without the extended spike; the body is so large it rests directly on the ground. I usually stand to sing, so had a second spike added to the bottom of the instrument so that I can play it upright. Surprisingly, there are quite a few mandobass makers around. 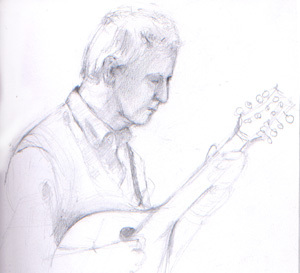 Mine was made by Robin Greenwood of Dorset, who makes a variety of guitars and folk instruments. I was told that the person who originally ordered it gave specific measurements but was still surprised by the size when he took delivery – which was why he sold it. I’d always wondered if the original owner had confused his inches and centimetres…or was maybe a stilt walker in a circus. The upside is that the sound is great even though the size can be a problem. Flying, as you can imagine, is a nightmare. I have flown within Europe but the mandobass occupies two seats and the cost becomes prohibitive for long distance flights. In these cases I’ll put my more robust Oakwood semi-acoustic double bass in the hold. I’m now looking at the possibility of a collapsible double bass. Another UK maker is Osborne who makes instruments for the Fretful Federation, a mandolin orchestra based in Brighton. These look fabulous but I haven’t played or heard one yet. US makes include Meyer, Stahl, Vega, Mauer and there are still a few old Gibsons around. People ask how the mandobass and double bass compare. I’d say that the sound of the mandobass blends better with the other plucked strings of the mandolin family. The strings are wound differently which gives a different sound. Violin family strings are tape wound which makes them smooth for bowing. Mandolin family strings are round wound (try saying that on a bottle of wine) which gives more attack for plucked notes. I actually find nickel bass guitar strings as good as anything on my mandobass. Violin family instruments have arched bridges whereas mandolins have flat bridges. Violin bodies are shaped at either side to facilitate the movement of the bow whereas mandobasses usually have round or oval shaped bodies, although some makers do take a guitar body shape. I have two other basses; a handmade 1988 semi-acoustic stick bass by Oakwood of Leeds and my most recent acquisition, an acoustic bass guitar by Beaver Creek of Canada. I bought the Oakwood in the late 1990s and love it. It’s great to play…and easier to transport! The body shape is like a large Appalachian dulcimer (Oakwood also make guitars and folk instruments including dulcimers) and the amplified sound is by means of a Shadow pick-up. I simply plug it straight into the PA. Unfortunately I haven’t taken it out as much as it deserves because the mandobass has become my trademark. Maybe next tour! Last but not least, I bought the Beaver Creek acoustic bass guitar in Newfoundland a couple of years ago. I’m usually not fond of acoustic bass guitars; the bodies are mostly over bulky (for me) in order to get the bass sound. The Beaver Creek is not only an elegant size and shape but has a really great sound. They’re not available in the UK as far as I know – an opportunity Phil?!! Your information is only used by Acoustics Records and is not sold or given to third parties.